Boediono and his bizzare students. He studied at University of Western Australia, for his Bachelor of Economics; Monash University Australia, for his Master of Economics; University of Pennsylvania USA, for his Ph.D; and Universitas Gadjah Mada Yogyakarta, for his title as professor. He's "a hawk on inflation". He succeeded in reducing Indonesian inflation from 17% to 5%! He's one the most influential people in Asia. His success means alot for the economy in Asia. He's the Koordinator Bidang Perekonomian Minister. He helps Indonesian economy in fiscal and monetary problems. 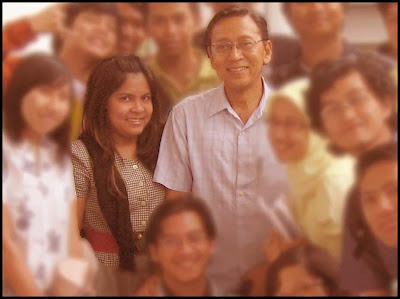 He's the Governor of Bank Indonesia this May 2008. He leads this central bank of our country until 2013. Never absent, never comes late, never dissapointed his unknown-student, even he have to teach every Saturday! Pak Boediono, you're the best.